BIBLIOGRAPHIA IRANICA: Achaemenid Religion. New book article: Skjærvø, Prods Oktor. 2014. Achaemenid Religion. Religion Compass. 8(6), 175-187. AWOL: Maarav Supplementary data online. Maarav: A Journal for the Study of the Northwest Semitic Languages and Literatures is an important journal edited and published by Bruce Zuckerman. The academic study of religion has been an interdisciplinary endeavor since its inception at the end of the nineteenth century. Much of the theoretical vocabulary that is needed to study religion has been imported from adjacent disciplines such as sociology, anthropology, historiography, theology, philology, literary studies, psychology, philosophy, cultural studies, and political sciences. It is the strength of the academic study of religion to bring these approaches into conversation with one another. The Vocabulary for the Study of Religion provides an excellent platform to sustain this conversation. Written by experts with a background in a variety of disciplines, over 400 entries collected in the Vocabulary offer a unique overview of critical terms in the study of religion(s), as well as the themes and issues that have to be addressed in future research. This is the first dictionary in English that covers such a broad spectrum of theoretical topics. The Vocabulary is an indispensable tool for all students of religion and it will influence the academic discussion for many years. AT NEW YORK UNIVERSITY: Ranieri Colloquium on Ancient Studies, “Telling Mesopotamian History"—October 22-23. New York University’s Center for Ancient Studies will host “Telling Mesopotamian History: Bringing to Life the Stories of Cuneiform Writing,” the Ranieri Colloquium on Ancient Studies, on Thurs., Oct. 22 and Fri., Oct. 23 in NYU’s Hemmerdinger Hall, Silver Center for Arts and Science, 100 Washington Square East (enter at 32 Waverly Place or 31 Washington Place [wheelchair accessible]). The conference will be held in honor of Jack Sasson, a professor at Vanderbilt University whose work has focused on two disciplines: Assyriology, specializing on the archives found at the Middle Euphrates town of Mari in Syria, and Hebrew Scripture, with interest on its narrative prose. This event will bring together nine scholars to “tell” Mesopotamian history through the medium of the story. Participants include a range of scholars drawn together by friendship with Sasson, who has for more than 40 years been one of the most prominent and important figures in ancient Near Eastern studies. The speakers will join with Sasson in presenting a wealth of ancient Mesopotamian history as compelling stories and commentary. Follow the link for the full program. Congratulations to Jack Sasson (of Agade List fame) for this well deserved honor. IT'S WHAT THEY DO: DEAD SEA SCROLLS: THE EXHIBITION CLOSES AS ONE OF THE MOST VISITED EXHIBITS IN CALIFORNIA SCIENCE CENTER HISTORY. LOS ANGELES, Sept. 11, 2015 /satPRnews.com/ — “Dead Sea Scrolls: The Exhibition” ended a successful run as one of the highest attended traveling exhibitions in California Science Center history on Monday, September 7, 2015, after a full week of sold out crowds. Lines wrapped around the Science Center building on Saturday, and guests arrived before 6 am in hopes of getting the last tickets available without a reservation for a small time slot in the afternoon. Extended hours were offered the last three weekends the exhibit was open, and sold out well in advance for each day the late hours were available. The exhibition, featuring over 600 ancient artifacts, opened in March. It sold out most weekends during its six-month long stay, drawing both local crowds and out-of-state visitors. H-JUDAIC: CFA: AAJR - Graduate Student Seminar. The topic is "From Text to Context, from Context to Text: Textuality & History in Jewish Studies" and it runs on 22-24 May, 2016, at Columbia University. The application deadline is January 25, 2016. Contrary to contemporary scholarship, I find that Greek was more widely used in both written and oral form by Jesus, his disciples, and the Jews who inhabited first-century Palestine. Interestingly, the evidence reveals that Greek became the dominant language spoken among Jews and Gentiles in Galilee in the first century CE. See Also: Did Jesus Speak Greek? (Pickwick Publications, 2015). Related posts here and here and links. UPDATE: Larry Hurtado also has recent related comments noted here and see also here. H-JUDAIC: TOC: Jewish Quarterly Review - Summer 2015 Vol. 105.3. First, Andrew Bernhard piles it on with yet another blog post, this one on Bart Erhman's blog: Back to the Forgery of the Gospel of Jesus’ Wife. Second, Joel Baden and Candida Moss step back to reflect on some of the larger implications of the GJW debate: Why Scientists and Scholars Can't Get Their Facts Straight. The ongoing dispute over the authenticity of a scrap of papyrus from the ancient world highlights a larger question of how history is established (The Atlantic). It may seem as if the cottage industry of debate surrounding this papyrus—which has now produced multiple funded lab reports, a slew of scholarly articles, and innumerable blog posts—is self-sufficient to the point that each side would continue to work irrespective of whether anyone continued to argue back. But perhaps debating against an opponent isn’t really anyone’s goal here. It is the nature of scientific inquiry to find the next frontier: These latest lab reports were generated not by interest in the GJW in particular, but by the development of new technology in ink analysis more generally. And scholarship in the humanities is virtually defined by the belief that every question can be reopened for discussion, even to reinforce a preexisting consensus. I certainly agree with the last sentence. The arguments of King et al. for authenticity are based on the antiquity of the materials used - the papyrus and perhaps the ink. But not only is it possible in principle to use old materials for a forgery, there are cases of it having been done as far back as the nineteenth century. The forger Constantine Simonides produced a fake palimpsest (a manuscript whose writing has been erased and written over with a new text) using an authentic ancient manuscript for the upper text. He also produced a fake ancient manuscript of the Gospel of Matthew using a genuine ancient hieratic manuscript whose text he had (imperfectly, it developed) erased. I don't know of a verified case of ancient ink being used in a forgery, but we know that ancient ink has been recovered and in principle it could be reconstituted with distilled water. In any case, let's see those tests of the ink published in peer-review publications before we start worrying about them. These considerations seem to me to weaken the arguments for authenticity based on material factors. No corresponding considerations that I know of weaken the many compelling arguments against authenticity based on literary analysis and manuscript layout. Not that one can't come up with a response individually to each argument, but the cumulative effect is to argue that in the case of the Gospel of Jesus' Wife we won the lottery. People sometimes do win the lottery, but that doesn't make for a persuasive scholarly case. Susan Marks, Hal Taussig (ed. ), Meals in Early Judaism: Social Formation at the Table. New York: Palgrave Macmillan, 2014. Pp. xii, 204. ISBN 9781137372567. $90.00. In studies of late Second Temple and Tannaitic period Judaism, interpreting formal ritual meals has led to important arguments about cultural difference and interchange. Was the Passover Seder, for instance, heavily influenced by Hellenistic symposia, as Seigfried Stein argued, or, as Baruch Bokser claimed, did it derive primarily from the elaboration of biblical traditions in the wake of the destruction of the Second Temple? The edited collection Meals in Early Judaism: Social Formation at the Table reframes this argument about ritual origins and influence. Its essays argue that we should adopt an expansive approach to Jewish ritual meals, comparing them to Greco-Roman parallels but also viewing rabbinic texts together with Philo as components of a broader culture. Meals in Early Judaism also shifts the focus of ritual study from text to context. Rituals are embodied, physical processes which happen in specific times and places, the authors argue. Studying them as such contributes to our understanding of how early Jews used meals to construct their social identities. H-JUDAIC: TOC: new Kabbalah studies. KABBALAH: JOURNAL FOR THE STUDY OF JEWISH MYSTICAL TEXTS, VOLUME 33 (2015) 320 pages. Good stuff. SYRIAC WATCH: Where do solitary monks live? Or, how to name various rocky places in Syriac (Adam McCollum, hmmlorientalia blog). It's good to know these things. AWOL: Mesopotamian chronicles. Livius pages, now updated. Ancient Mesopotamian chronicles are sometimes of interest for ancient Judaism and ancient Israel, for example, here. ALIN SUCIU: Volume in Honour of Peter Nagel. For you, special deal! Down the rabbit hole of Marcion. Fascinating stuff. H-JUDAIC: Conf: Medical Knowledge from Ancient Babylonia to Talmudic Babylonia. In Jerusalem on Sunday, September 20th, 2015. David T. Runia, Gregory E. Sterling (ed. ), Studia Philonica Annual: Studies in Hellenistic Judaism, Volume XXVI. Atlanta: Society of Biblical Literature, 2014. Pp. ix, 274. ISBN 9781628370195. $51.95. The Studia Philonica Annual celebrated its twenty-fifth anniversary last November, a fitting indication of the flourishing state of Philonic studies and a far cry from the short-lived and less polished Studia Philonica of the 1970s. The annotated (2011) and provisional (2012-2014) bibliographies of works directly or significantly addressing Philo and eight book reviews are preceded by eight articles. The articles reflect a range of interests: philosophical/theological issues, Philo’s patristic Nachleben, and a Special Section on non-biblical Hellenistic Jewish and non-Jewish sources. The conceptual and methodological sophistication of these articles appears throughout. Is the GJW debate over? ONE HOPES: The End of the Gospel of Jesus’ Wife Forgery Debate (Andrew Bernhard, NT Blog). I've been of the view that the GJW has been conclusively debunked for a long time, but a few still seem to want to keep the debate going, which is their prerogative. We'll see. Background here with many links. THIS WEEK'S DAF YOMI COLUMN BY ADAM KIRSCH IN TABLET: Do Cows Speak? And Other Problems of the Nazirite Vow. In this week’s Talmud study, debates over swearing out of pique or spite—that is, in the wrong frame of mind. THE OLD BECOMES NEW AGAIN? Modern Revival of Lost Biblical Commandment Paving the Way for the Third Jewish Temple (Adam Eliyahu Berkowitz, Breaking Israel News). Biblical commandments not practiced for thousands of years are slowly returning to life. One such commandment, known as the Machatsit HaShekel, or half-shekel, is making a comeback thanks to a simple Jewish tailor in Jerusalem. The half-shekel, one of the more obscure commandments found in the Bible, played an important role in Jewish history. Every year, each Jewish male over the age of 20 was obligated to give a compulsory donation of half of a shekel (Exodus 30:15). Regardless of status or wealth, the same amount was given by each man. Since it is forbidden by Torah law to actually count Jews, counting the coins took place of a national census. The half-shekels that were collected were used as a form of tax to support the Jewish Temple. The nation of Israel continued to observe the commandment even after the First Jewish Temple was destroyed until it was outlawed by Roman Emperor Hadrian in the year 135 CE. Even Jews who lived outside of Israel continued to donate the half-shekel, despite the Roman Senate forbidding the export of gold and silver. Reuven Prager, a tailor specializing in Biblically-styled clothing, is responsible for today’s revival of the lost commandment of the half-shekel. Prager’s passion for Biblical authenticity led him to investigate the commandment of the half-shekel. Being a practical-minded artisan, he began to mint his own half-shekel in March 1997 with a run of 1,000 coins. Today, Prager continues to mint a new half-shekel coin every year with a new design based on a Temple vessel or tool that has actually been reproduced. Just for the record, I oppose any construction projects that involve tearing down ancient monuments or excavation on the Temple Mount. Even any archaeological exploration of the area should wait until we have non-intrusive and non-destructive technologies to do the work. There is more on the ancient half-shekel coin and its tax use here, here, and here. But this turned out not to be relevant. Incidentally, the half-shekel tax is mentioned in the New Testament in Matthew 17:24-27. LARRY HURTADO: On Linguistic and Textual Complexity in First-Century Christianity. The first report I've seen on BNTC 2015. If you find others, please let me know. ANDREW BERNHARD: The Forger and the “Translator” (The NT Blog). 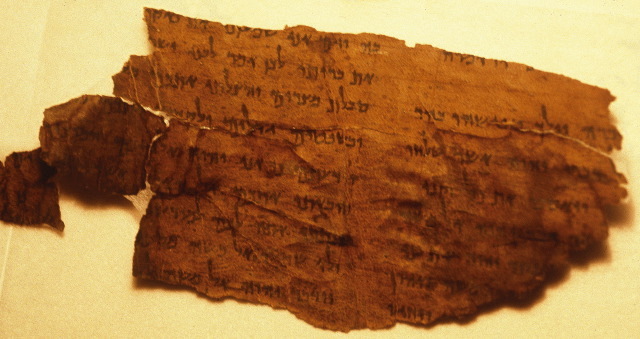 Since the recent release of the “translation” that the owner of the Gospel of Jesus’ Wife gave Karen King and the revelation that it is directly dependent on the English of Grondin’s Interlinear, a few questions have been asked about whether someone might have used Grondin’s Interlinear to translate an authentic ancient papyrus fragment. The answer is, quite simply, “No.” The person responsible for the owner’s “translation” must have been involved in forging the Gospel of Jesus’ Wife papyrus fragment (either as the actual forger or by working very closely with the person who was). LIV INGEBORG LIED: 4 Ezra in Syriac lectionary manuscripts – three points for further reflection. I noted the pre-publication of Alin Suciu's article on Copto-Arabic 4 Ezra here. More from Professor Lied on 4 Ezra in Syriac lectionaries etc. is noted here and here. Papyrus Amherst 63 is an extraordinarily important and extraordinarily difficult text that merits much more attention than it has yet received. The papyrus seems to have come from Elephantine and is the work of Aramaic-speaking worshippers of the god Betel (Bethel). It includes three Israelite hymns, one of which is a Canaanite version of Psalm 20, and a legendary account of an unsuccessful revolt of Babylon against Assyria around 650 BCE. There have been efforts to decipher some of it, but a great deal of work remains to be done. I knew that Professor Tawny Holm of Penn State was working on an edition, but this is the first I have heard of Dean Koller's work. I look forward to seeing more published on this remarkable text. Cross-file under Aramaic Watch, although the papyrus also includes material in Hebrew/Canaanite. ARRESTS: Arab Thieves Damage Ancient Church Mosaic. Several Galilee Arabs were arrested after they were caught trying to dismantle a sixth-century mosaic floor from an ancient church (Moshe Cohen, Arutz Sheva). There were large pieces of the mosaic in the trunk of the vehicle of the arrested suspects. THE GREEN COLLECTION: Critics call it evangelical propaganda. Can the Museum of the Bible convert them? (Noah Charney, Washington Post). To many in the scholarly community, the museum seems like an oversize piece of evangelical claptrap. Some academics and curators also worry about the origins of its collection — the more than 40,000 biblical artifacts were amassed in a remarkably short time by Hobby Lobby President Steve Green. But the museum is trying to pitch itself as deserving of its spot. Last month, it inked a deal to display a selection of objects from the Israeli government’s eminent Antiquities Authority. And it has hired David Trobisch, a prominent liberal academic, to head its collection. It will be up to Trobisch to win over skeptics and transform this intriguing assembly of artifacts into an institution that brings a bit of church to a secular state. At the heart of the Museum of the Bible is the Green Collection, a huge, disjointed assemblage that includes pieces of the Dead Sea Scrolls, a Gilgamesh tablet, Elvis Presley’s Bible and about 850 manuscripts, 12 of which are in Hebrew and come from China’s Jewish population. A third of the material may be considered Judaica, related to Judaism and the Old Testament, including torahs that survived the Spanish inquisition and the Nazis. Many of the objects are more important than beautiful, more interesting than spectacular. I am reserving judgment on the museum until I see what it does once it is actually built and in operation. More on the Museum of the Bible and on the Green Collection is here and many links. DISTURBING PARALLELS: ISIS to Temple Mount - 'Barbaric' Islamist War on Antiquities. At annual Jerusalem conference, world experts lament ISIS funding war via illegal antiquities trade, Waqf barbaric Temple Mount destruction (Eliran Baruch, Arutz Sheva). Thursday saw the 16th annual conference of archaeological experts convene in Jerusalem's City of David. Entitled "From Jerusalem to Babylon and Back," the conference had an extra significance this year with the unprecedented, public destruction of ancient antiquities by the brutal Islamic State (ISIS) terrorist group in both Iraq and Syria. There is a video interview with Matthew Bogdanos and Dr. Donald Sanders. Background on the assault of ISIS on the past and its caretakers is here and here and links. Also at the conference was leading Israeli archaeologist and Israel Prize winner Dr. Gabi Barkai, who noted that destruction of non-Muslim antiquities by Islamist extremists was not confined to ISIS. The Islamic Waqf authorities on the Temple Mount were mounting an equally "barbaric" campaign to destroy any Jewish artifacts which conflict with their narrative of the site as a Muslim one. "The Muslims are responsible for the destruction that's going on on the Temple Mount - a barbaric destruction," he said. "The Waqf is destroying everything, even Muslim antiquities, just like ISIS." Background on Dr. Barkai (Barkay), his Temple Mount Sifting Project, and the damaging illicit digging by the Waqf on the Temple Mount is here and links. UPDATE: Related, a quick overview by Noam Matas of the Temple Mount excavations: Israel’s Top Archaeological Sites- Temple Mount Excavations (Jewish Press). Cross-file under Temple Mount Watch. A chapel of the first Roman Christians? ARAMAIC WATCH: Roman Christians’ first church found in Diyarbakır, southeast Turkey. Excavations at the ancient Roman military outpost of Zerzevan Castle in the Çınar district of Turkey’s southeastern province of Diyarbakır have uncovered a chapel belonging to the very first Romans who converted to Christianity (BGNNews.com). “We can say it’s the first place of worship from when the Romans transitioned from polytheism to Christianity,” Dicle University Archeology Faculty Assistant Professor Aytaç Coşkun said referring to the recently uncovered underground chapel in Diyarbakır’s Zerzevan Castle. Pointing out that they discovered several crosses as well as Aramaic script on the chapel’s walls, Coşkun says they have invited an Aramaic expert to decipher the writing. I don't know what the evidence is for the extraordinary claim made in the first sentence of this article, but I am skeptical. It does not help that no absolute date for the earlier discoveries is given, or for the church that was built "about 150 years later." The end of the article does specify that the castle was still in use up to 639 CE, but that doesn't clarify the dates of the earlier discoveries. But in any case, I would like to hear more about the Aramaic inscriptions (if that's what they are) on the walls of the underground chapel. LEGENDARY NAMES THAT KEEP COMING BACK: A wall of iron built to keep out Gog and Magog. The two giants in London's Lord Mayor's Show surprisingly figure in the Koran too (Christopher Howse, The Telegraph). The 14ft-high wicker figures of the giants Gog and Magog are being spruced up for the Lord Mayor’s procession, which they will lead in a few weeks’ time. Sticklers insist that they should be called Magog and Corineus, placing their confidence in the 12th-century account by Geoffrey of Monmouth of the fight between those two heroic figures. But the City of London giants are carefully labelled Gog and Magog. Gog and Magog first appear in Ezekiel 38-39. The last book of the Bible, Revelation, takes up the names when it says that at the end of the world, after Satan has been bound for 1,000 years, he will be loosed and will “deceive the nations which are in the four quarters of the earth, Gog and Magog”. What surprised me was to find Gog and Magog in the Koran. Muslims regard the Koran as the uncreated word of God. That need not present difficulties for the tales found in Sura 18 of the book, even though they bear similarities to folklore from other sources. Actually the phrase "possessor of two horns" comes originally from the biblical book of Daniel and it seems to be applied to Alexander through a mixup, or at least some lateral thinking. See this post for details. The Alexander Romance, of which I was not aware, may be the missing link between Daniel and the Qur'an. Keep reading for the story about Gog and Magog in the Qur'an. BOOK REVIEW: A Jewish Slave in the Roman Empire. The unique relationship between a Galilean Jew and a third-century Roman officer is the focal point in Eli Avidar's new novel (Yaron Avitov, Haaretz). One would expect that an Israeli-authored novel about the Roman era would engage in the Jewish revolt against the Romans, but Avidar chooses to veer away from that subject: His first novel takes place in the Roman Empire at the start of the third century C.E., about 130 years after the Temple’s destruction. The rebellion that takes place in this novel is that of the Dacians and Carpis, two tribes from which sprang the Romanian people of our times. The earlier revolt might have attracted more of the Hebrew reader’s attention, but in this case revolt is not the main story. The core of “Ictus” is the relationship between the Jewish slave and his Roman master, an officer in the Legion, and the book succeeds in attracting our interest and enlivening a period that Hebrew literature barely touches. “Ictus” delves into the relationship between a Jewish slave named Yoir and the Roman officer Yarenis, a brave fighter who is deft with both sword and pen – and who, with the help of his astute slave, manages to rise to greatness and teach innovative fighting techniques that differ from those formerly practiced in Rome. The techniques are designed to respect the dignity of the enemy without seeking to humiliate or torture him. For instance, Yarenis instructs his troops how to put their enemies to death with a single thrust of the sword – a thrusting maneuver called Ictus. MODERN ARAMAIC WATCH: New Documentary Explores Chaldean Experience in El Cajon (Times of San Diego). The article and video do not mention it, but Chaldeans speak a modern Eastern dialect of Aramaic. The expatriate Chaldean community in Southern California has also been mentioned here. They also have a large expatriate community in Michigan, on which more here, here, here, here, here, here, and links. DUST: The August Carnival for Biblical Studies CXIV (Bob MacDonald). Azzoni and Stolper, "The Aramaic Epigraph ns(y)h ̇"
AWOL: New in ARTA: From the Persepolis Fortification Archive Project, 5: The Aramaic Epigraph Ns(y)h on Elamite Persepolis Fortification Documents. Cross-file under "Aramaic Watch." Lots more on the Persepolis Fortification Archive Project and its tempestuous political history in recent years is here and links. Betsworth, "Children in the Gospels"
Often, 21st century people think that Jesus is saying that we need to become innocent like children or just have faith like children. But his first century audience would have thought about the vulnerability, dependence, and marginal status of children in their world. They wouldn’t have thought of an idealized view of children and childhood, but rather that Jesus was telling them to become among those of low status. See Also: Children in Early Christian Narratives (London: Bloomsbury, 2015). ASOR BLOG: Shikhin Between Jews and Romans (James Strange). We can now say with great confidence that Shikhin is the site of the northern lamp workshop, or one such workshop. This fact opens up whole new set of questions, not only about Jewish identity and commerce, but also about the migration of Judeans northward as refugees after these two devastating wars with Rome. The idea of refugees, in turn, raises questions about the stability of the Galilee and economic stresses born from the upheavals of war. Preserving, strengthening, and expressing identity through material culture, food, language, and styles of dress (among other things) would have enhanced stability. Material culture is virtually the only one of these left for us to find, but it still speaks powerfully about the ability of Galilean Jews to hold on to their identity in the wake of catastrophe.